The R. A. 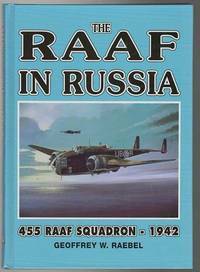 A. F. In Russia - 1942. 455 RAAF Squadron - 1942. Australian Military Historical Publications, (1997).. First Edition; 4to; pp. xiv, 130; appendices, bibliography, index; original blue illustrated slick boards, a fine copy. R.A.C.S. Foundation. A Report on the First Five Years and Future Perspectives. 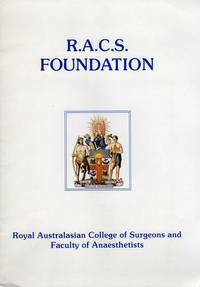 Royal Australasian College of Surgeons and Faculty of Anaesthetists, 1985.. Lge. 8vo; pp. iv, 20; profusely illustrated in colour and b/w; stiff stapled illustrated wrapper; minor browning to wrapper, otherwise a fine copy. R.A.F. Aircraft of World War Two. : (including some aircraft of F.A.A.). London, Ian Allen, n.d.. Sm. 8vo; pp. 64; numerous b/w illustrations; stiff stapled illustrated wrapper, ink on title page, spine and corners bumped, otherwise a very good copy. R. A. M. C. Training Pamphlet No. 3. 1952.: First Aid and Nursing for Other Ranks. n.p. Royal Australian Medical Corps, The War Office, 1952. . First Edition; 8vo; pp. 353; numerous b/w line drawn illustrations throughout, 8 pages of colour plates; original stiff printed wrapper, institution stamp to front and back of wrapper, crease to back and last few pages, a good copy. R. D. Fitzgerald: A Bibliography. : Bibliographies Of Australian Writers. WAGENINGEN, J VAN; O'BRIEN, P; Compilers. Adelaide, Libraries Board of South Australia, 1970.. First Edition; 8vo; pp. viii, 72; index; portrait frontispiece, stiff wrapper, wrapper faded, previous owner's name plate on front endpaper, a good copy. Adelaide, Libraries Board of South Australia, 1970.. First Edition; 8vo; pp. viii, 72; index; portrait frontispiece, stiff wrapper, edges of wrapper faded, otherwise a very good copy. The Bread and Cheese Club, (1949). 8vo; pp. 6; 2 b/w illustrations; stiff stapled wrapper, newspaper article tipped to inside of front wrapper, light browning to pages, otherwise a very good copy. The Bread and Cheese Club, (1949). 8vo; pp. 6; 2 b/w illustrations; stiff stapled wrapper, previous owners name on verso front wrapper, pencil underline marks throughout, a good copy. n.p. Printed in Great Britain by Photo Precision, n.d.. Sm. 8vo; pp. 24; back map endpaper, numerous colour illustrations; stiff stapled illustrated wrapper, previous owners inscription on front endpaper, stamp on title page, good copy. R.H.S.V. Journal. : Vol. 56, No. 1 March 1985 216th Issue. 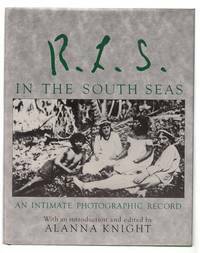 The Royal Historical Society Of Victoria, 1985.. 8vo; pp. 64; stiff grey wrappers, a fine copy. R.H.S.V. Journal. : Vol. 56, No. 2 June 1985 219th Issue. 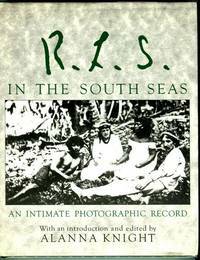 The Royal Historical Society Of Victora, 1985.. 8vo; pp. 64; stiff grey wrapper with very minor wear, inscription on rear wrapper, still a very good copy. R.L.S. In The South Seas. : An Intimate Photographic Record. Edinburgh, Mainstream Publishing Company, (1986). . First Edition; 8vo; pp. 192; portrait frontispiece, profusely illustrated with b/w mainly photographic images throughout, appendices; original cloth, dustjacket, minor bumping to bottom corner of pages, otherwise a very good copy. Edinburgh, Mainstream Publishing Company, (1986). . First Edition; 8vo; pp. 192; portrait frontispiece, profusely illustrated with b/w mainly photographic images throughout, appendices; original cloth, dustjacket, flecking to top edge of pages, minor brown stains to half-title page and first few pages, otherwise a very good copy. R.M.C. : The Work of the River Murray Commission. N.P. (Government Printer, A.C. Brooks, Melbourne), 1965.. Revised Edition; 8vo; pp. 48; map frontispiece, 11 b/w illustrations, 5 maps/plans, 5 tables; stiff stapled illustrated wrapper, a good copy. The R.M. Johnston Memorial Volume. Hobart, John Vail, Government Printer, 1921.. 8vo; pp. viii, 470; frontispiece; original cloth, spine cocked, very good copy. Being a Selection of the Principle Writings in connection with Geology and the Economic and Social Problems if the Day. Melbourne, The Hawthorn Press, 1940.. Limited Edition; 8vo; pp. (vi), 95; original green cloth, insect damage to cloth, a good copy. Limited edition of 150 copies. 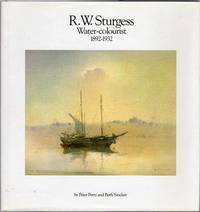 R. W. Sturgess: Water Colourist, 1892 - 1932. (Castlemaine), Castlemaine Art Gallery and Historical Museum, (1986).. Square 4to; pp. 96; portrait frontispiece, list of plates, appendix, selected bibliography; original cloth, minor marks to rubbed dustjacket; otherwise a fine copy. This Edition is limited to 1,500 copies of which this is No. 122. Signed by the authors. RAAF 70th Anniversary Air Show. Hornsby, Chevron publishing Group Pty Ltd, 1992.. First Edition; 8vo; pp. (iii), approx. 200; numerous coloured illustrations throughout; dustjacket, a fine copy. 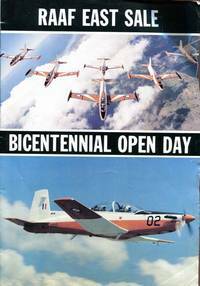 RAAF East Sale Bicentennial Open Day. (N.p. 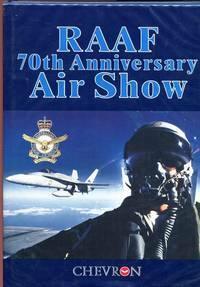 Royal Australian Airforce, c.1988). . First Edition; 4to; pp. (xxiv) un-paginated; profusely illustrated with colour and b/w mainly photographic images; original stiff stapled illustrated wrapper, creasing to edges, a good copy. RAAF Rader In World War II. Pictorial No. II. 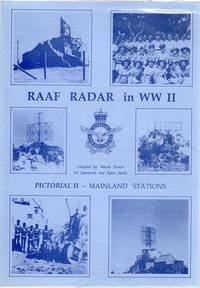 being another scrapbook of history, a collection of photographs of Radar Stations on Mainland Australia. FENTON, MORRIE; SIMMONDS, ED; SMITH, NORM; Compilers. (Forster, E.W. & E. Simmonds, 1992).. First Limited Edition; 4to; pp. iv, 93; numerous b/w illustrations, maps; stiff illustrated wrapper, a fine copy. Signed by the compiler (Ed Simmonds).